New research demonstrated that graphene can kill bacteria by slicing through their membranes and pulling out their phospholipids. Graphene may be used in the future as an antimicrobial material for everyday use, applied directly to wounds. A sort of graphene "band-aid". Graphene may also be used to create novel antibiotics. The researcher explained that graphene cut through the membranes and extracted large amounts of phospholipids from cell membranes because of strong dispersion interactions between graphene and lipid molecules. 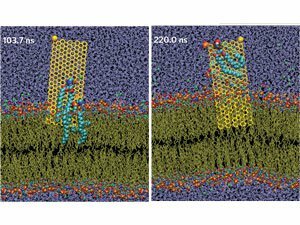 Both the graphene and and phospholipids are pushed together by water, which creates hydrophobic interactions. If you mix graphene and graphene oxide, add cotton-fabric and create a band-aid it can be a straightforward way to use graphene's bacteria-killing ability. The Graphene oxide is useful because it has better solubility in water than regular graphene. Of course we still need to discover how graphene effects human cell membranes - before such a device can be developed safely. Theoretically graphene should be less of a threat to humans or other mammals cells because in those case the graphene becomes surrounded by serum proteins. We already know that graphene can be harmful for bacteria, but by using other damage mechanisms. Back in September 2012 it was reported that graphene-based materials kill substantially more bacteria than graphite-based materials. In February 2013 it was reported that graphene can be used for photothermal antibacterial therapy, as both gram-positive Staphylococcus aureus and gram-negative Escherichia coli were efficiently captured by glutaraldehyde and concentrated (or immobilized) by the magnetic property of a magnetic reduced graphene oxide functionalized with glutaraldehyde.Graphene can also be used as a bacteria sensor.